The one thing I have learned since joining YL as an independent oil distributor is most of us have one thing in common. We are a compassionate group of individuals that care deeply about our families, community and friends. I am appealing to that compassion within you to donate towards us YL Independent Distributors digging deep to solely ourselves donate a water well to a destitute area in Africa. My oldest brother goes to Africa annually to do mission work. The last trip to Ethiopia the one thing that resonated with me was him talking about how the drought was taking a toll on the babies and the elderly. They are literally laying on the sides of the road dying. Our group is far reaching. If every person just donated 2.00 we would more than reach our goal. I know some won't donate, or can't donate, and that's understandable. 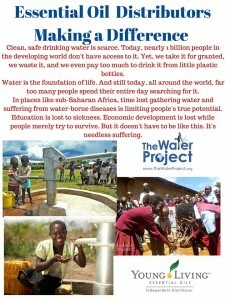 But for those of you that can and will, nothing would make my heart happier than to see us solely fund a water well. 09/20/15 Pamela Eichenlaub Graham $15.00 Honoring Mollie Burnett's Dad's 80th Birthday! 09/20/15 Kimberly Zick $34.00 Such a great cause to donate to! 09/20/15 Tanya Smith $15.00 Everyone should have clean and healthy drinking water. God bless! 09/19/15 Kathleen Shafer $15.00 God bless you! 09/19/15 Lisa Thomley $15.00 Thanks to all who lend their time, energy and money to this very worthy cause! 09/19/15 Leah E Hamby $15.00 Happy 80th birthday Mollie's dad! 09/19/15 Rachel Brown $30.00 Celebrating and Honoring Mollie's dad. Happy Birthday! 09/19/15 Page Himes $80.00 Celebrating Mollie's dads 80th birthday!